By Sally & Ken H. "Outstanding!! Very pleasant experience. Ayers Basement..."
"Ayers offered a permanent solution to my basement issues..."
This crawl space came a long way during the remodel process. As you can see in the after photo, the entire crawl space was covered with the plastic white liner CleanSpace. The moisture impenetrable barrier is perfect for dirt crawl spaces where it’s easy for moisture and water to pass through. CleanSpace can be wrapped around other objects, like the piers seen in the photos, to prevent moisture from affecting them as well. If moisture does enter this crawl space from another source, one of the other two products installed will swiftly deal with the problem. The blue box in the after photo is a SaniDry CX dehumidifier. Its smaller size makes it the perfect for crawl spaces, and its self-draining ability makes it great a complement to the SmartSump sump pump system, also in the after photo. The smart Sump will keep this crawl space continually dry by pumping out any water trapped under the vapor barrier. A full crawl space system like this will cover any and all possible problems for the homeowner. This Mackinac City, MI was dealing with the-ever-so common leaky and moldy crawl space. To give the customers a solution that works and help their energy costs at the same time, our crew installed the Ultimate Energy Saver package. The package includes two different types of insulation: SilverGlo Walls and Terrablock foam for the floor. These products will help better regulate the temperatures of the crawl space and provide a waterproof solution at the same time. Both are made of waterproof material and won’t allow water or humid air (the key ingredients to mold growth) to leak into the crawl space. Don’t look too hard for Terrablock in the after photo. The key to keeping mold and water out is the CleanSpace encapsulation. That’s the white, plastic liner seen in the after photo and it covers every inch of the crawl space floor, including the Terrablock foam. Impenetrable by water vapor or moisture, a CleanSpace encapsulation is just what this crawl space needed to put a stop its leaking water and energy problems. While installing a full waterproofing system into this home in Petoskey, MI, the crew also upgraded the owner’s previous sump pump. If a home is having trouble keeping water out, we almost always recommend the TripleSafe sump pump - our most reliable model. As you can see in the after photo, the pump comes equipped with two different discharge lines. That is because the sump also includes two different backup pumps: one in case the original pump becomes overwhelmed and the other for power failure. With so much water being discharged, a single line could prevent the system from living up to its full potential or, even worse, it could cause the system to backlog and fail. As our most reliable model, it’s also our most expensive. But we think that the peace of mind makes it worth it. This basement will be protected from floods, no matter how much wet it gets. Our crawl space leaks every year. Lots this year. We believe it seeps up through the floor. Can you help? I have just purchased a home and completing a full renovation. The crawl space is retaining water and would need an estimate on sump pump and encapsulation. I have a one and a half foot section of concrete approximately 20 feet long next to the garage that needs to be leveled. Vehicles will drive over this on a daily basis. Thanks! Dennis was very knowledgeable when presenting the problems.solutions, appreciated the "evidence-based" sciecne behing the system. Ayers Basement Systems has been helping homeowners and businesses in Petoskey with basement waterproofing and foundation repair for 35 years. We have successfully completed hundreds of basement and foundation projects throughout Michigan & Indiana, including Petoskey. If you need foundation repair, basement waterproofing, concrete leveling and crawl space encapsulation we are your trusted contractor. 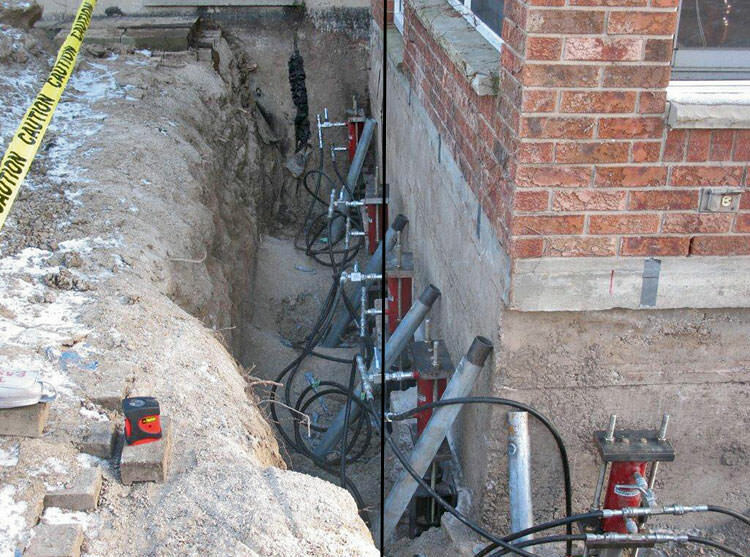 We have the needed experience, expertise and tools required to create permanent foundation and basement repairs. Call us today, 1-844-262-2971, for a free home inspection and no-obligation cost estimate. Water and moisture in the basement means mold and rot. Both of which are dangerous for your home and your family. Ayers Basement Systems protects you from mold and rot by properly waterproofing your basement or crawl space and giving you a transferable, lifetime, dry-basement warranty. As members of Basement Systems, the international network of waterproofing contractors, we receive advanced training and access to proven, patented basement waterproofing products. The training and products come together in a complete basement waterproofing system. The system consists of an interior drainage channel that runs along the inner perimeter of the basement. Any entering water is collected in the channels and drained to a hidden sump pump which pumps the water out of your home. The addition of an energy-efficient basement dehumidifier keeps the relative humidity low enough to prevent mold growth. We use a similar waterproofing system to keep your crawl space dry and protected. A insulated matting and vinyl vapor barrier are laid on the floor and walls of the crawl space. The crawl space vents are sealed and a sealable entryway is installed. The system keeps water and moisture out of the space. A crawl space sump pump and dehumidifier complete the system removing any water or moisture that manages to enter the space from upstairs. No water in the basement. No mold or rot. No uncomfortable floors above the crawl space. Foundation problems are serious challenges that need to be immediately addressed. Ayers Basement Systems is Petoskey's trusted foundation professional offering permanent foundation repair and restoration services. If you are dealing with a sinking or settling foundation issues we have solutions. Depending on the foundation problem you are facing we have different piering systems. The piers are drilled down into the earth to find load bearing strata. These piers include helical piers, push piers, slab piers and helical deck piers. For bowing basement walls we can use wall anchors, wall support systems or sprayed concrete to correct the problem. We even fix sunken floors over crawl spaces with support jacks. Using an updated mudjacking technique (aka slab jacking) we lift and level sunken concrete slabs. The traditional mudjacking process requires a thick mudslurry be pumped beneath the sunken slab through holes drilled through it. The pressurized mudslurry lifts the sunken slab back to its original position. Rather than use mudslurry we instead use PolyLEVEL, an expansive polyurethane foam. The foam expands to fill any gaps beneath the slab. It is much lighter and puts less stress on the soil base. It also cures within hours rather than days. We offer the best solution for concrete lifting and leveling in Petoskey. The finished crawl space is brighter, cleaner, and dryer. The SaniDry Sedona dehumidifier in the background helps to keep the humidity at safe levels and deposits any moisture that it removes in the sump system. The sump pump discharge line features an IceGuard fixture to give water an escape in the event that the line becomes frozen. This prevents any backups in the crawl space. Air tight vent covers seal the vents to give us ultimate control of the humidity levels in the crawl space. Our customers called us with some trouble, during heavy rain the house would start leaking. Ayers was able to help fix those issues by installing a new sump pump and a waterproofing solution called WaterGuard that helps to move water to the sump pump. For the discharge of the sump pump, it is important that the water gets outside of your home and we recommend installing IceGuard. IceGuard attaches to your discharge pipe outside of your home to act as protection against frozen pipes that would otherwise cause a flood in your basement or crawl space. This cheap addition to your home allows for more protection against cold Michigan winters and will help to keep your space nice and dry. Ben D. of Petoskey, MI has had water issues in his basement for years. Every time it rains, water comes into the basement. There was a dehumidifier in the basement and it took care of mildew, but there was still an odor. So, Ben gave us a call. Sharon S. of Petoskey, MI had water leakage in her basement for years before she gave us a call. This can cause immense issues for a basement -- issues that we, the professionals, can take care of. Sharon, you can rest easy with these systems from Ayers in place. Mary M. of Petoskey, MI had dampness and standing water in her crawlspace. Her foundation is cinderblock and the home was built in the 1980s. With this being said, you can probably see that she had a problem. Thankfully, she called us. We remedied this situation by installing three of our patented products: the CleanSpace crawl space encapsulation system, the SaniDry crawl space dehumidifier, and the SmartSump crawl space sump pump. CleanSpace is a 20mm thick plastic lining that completely seals off Mary's crawl space from the surrounding elements. No air, dirt, or water will get into this crawl space with this installment. 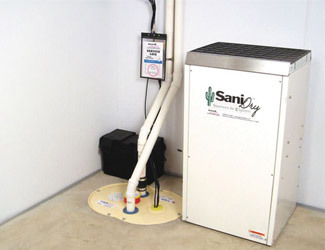 SaniDry is a self-draining dehumidifier that adds another barrier of protection against water vapor. SmartSump is a sump pump built for crawl spaces. These products all fit together like a glove. Say goodbye to standing water with this trio. Bill C. of Petoskey, MI had water in his crawl space. This can cause serious issues within the home such as sticking doors and windows and peeling paint. So, Bill gave us a call. After a complete inspection, we decided the best way to remedy this situation would be to install our SmartSump crawl space sump pump and the CleanSpace crawl space encapsulation system. We started with the SmartSump -- SmartSump is a self-draining sump pump that can collect 109 pints of water without its collection tray having to be emptied. SmartSump works perfectly with the CleanSpace system as well. Next, we installed the CleanSpace. CleanSpace is a 20mm thick plastic lining that completely seals off Bill's crawl space from the surrounding elements. No dirt, dust, cold air or water will enter with this system in place. CleanSpace is also made with an anti-microbial component, preventing the growth of any mold. Rebecca M. from Petoskey, MI has a basement that had french drain system that no longer works. Since the snow has started to melt, her basement began to fill with water. Her home was built in 1968, has poured wall, and has a sump pump. The basement is not finished and there was water coming in from the outside. Our fix? The WaterGuard French drain system. WaterGuard is a customer and crew favorite, offering a great way to protect your home against water intrusion. WaterGuard rests below the basement floor but above the foundation footing, collecting water that enters in through the basement walls. That water is then redirected to the sump pump in the home and pumped outside. My basement has a french drain system that no longer works, and now that the snow is melting my basement is filling with water. Need to know the best solution to stop it. Wetness/mold problem in the crawlspace from a leaky dishwasher. Want an opinion on the condition of the crawlspace as I feel the inspection we had before we bought the house was not as accurate as it could have been. We have a 1950 ranch home with a full basement, old asphalt tiles on the basement floor. We have moisture leaking through corners of the basement (block wall foundation), and also up through the asphalt tiles. No rivers, but definitely a problem, as we'd like to make the basement usable (and safe for) storage and possibly additional living space. We'd like an estimate as to what it would cost to waterproof the foundation and floor. Thanks.